Sad Olivia has no interest in seeing anyone now even though her drunken Uncle Sir Toby means her to be wooed by one Sir Andrew. But she will see none but the Duke's new messenger, Cesario who is trying to plead the Duke's case to her. She'll have none of it and instead falls in love with "him", much to Cesario's distress. Sir Toby and Sir Andrew, and a sneaking handmaid Maria contrive to play a joke on their arch enemy Malvolio, the right hand man of Olivia. They fake a letter in Olivia's hand proclaiming her love for him, and that he must wear yellow socks in her presence - something of course, Olivia really detests. He grandly imagines himself the next Lord of the castle and does as the letter requests - Some are born great, some achieve greatness, and some have greatness thrust upon 'em. Malvolio-2.5.149-50. She, of course, not knowing why he does what he does, has Malvolio declared insane and locked in a box, much to Sir Toby's and Sir Andrew's glee. Meanwhile, Sebastian, Viola's look alike brother has also been saved from the sea by the pirate Antonio. They become friends and travel to the land of the Duke not knowing that Viola is also alive and looking very much like her brother. Will Cesario have to marry Olivia? What will happen to the poor Duke? Will the two twins ever be reunited? Is Malvolio doomed to spend his life in a box? Reading a Shakespeare play and seeing a Shakespeare play on the stage is almost two completely different things. With one you smile a few times, with the other you laugh until you fall off your seat. Same words, different reactions. Without being able to witness the facial expressions, the mannerisms, and tones of voice of a good actor, it's almost easy to get lost in the language one must concentrate on so hard for the meaning. At least for me. Seeing it performed brings the words alive in perfect clarity. 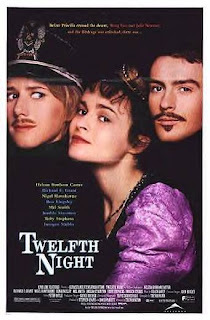 Having both read and just attended a production of Twelfth Night, what would I say Shakespeare thought of love, romance and human nature? In this play, and I'd venture in most of his comedies, I'd say love and romance always has a tidy ending, no matter how untidy it's beginning and human nature, well, we are all pretty fickle I guess. Throw in that and fool and you're set. I'll leave the true nature of love to Romeo and Juliet. I had so much fun watching this it now rates a close second to A Midsummer Nights Dream. It was that good. A warm summer evening, good food, good friends and a Shakespeare play. Seriously, what more does a person need? Little else. I do seem to be following in his footsteps. Is he reading all of them? I'm game. I read Henry the VII last month. Just let me know what's coming up next - but give me a few days as speed reading Shakespeare is like driving fast through a school zone - dangerous to your health. I'm reading Richard 2 right now, but will read the two Henry 4's next. But I also plan on reading the Tempest which might be more fun?